Our doctors will do a thorough exam and explain their findings to you in detail. We welcome new patients to our office. During your first visit, you’ll meet our friendly staff and the doctor will give you a tour of the office so you feel comfortable and well-oriented. You will find that we have a friendly family atmosphere and truly care about our patients. Our primary goal is to keep your smile healthy for life. 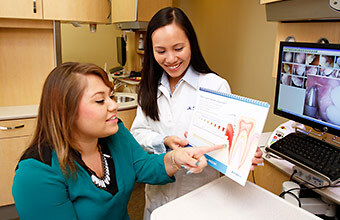 Staying well-informed about your oral health with regular exams plays an important role in this. 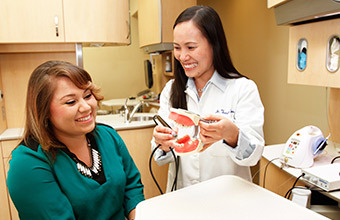 Our doctors emphasize communication in their approach to dental care. They will listen carefully to get an understanding of your needs and goals. They will clearly inform you about any oral issues, should they identify any during your exam, and they will explain in detail all of your treatment options. 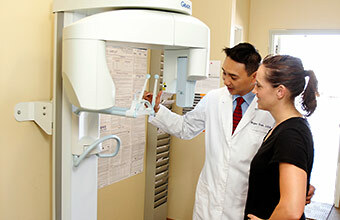 Our digital panoramic X-rays provide one comprehensive image of the whole mouth. We will take any necessary digital X-rays. We may also take a panoramic X-ray, which provides a detailed view of the whole mouth in one image. The doctor will carefully examine your teeth and look for any signs of tooth decay or gum disease. The exam includes an oral cancer screening as well as a periodontal exam for evaluating the health of your gums. An intraoral camera shows images of the inside of your mouth on a screen. The doctor will take intraoral photos to go over with you, so that you have a clear understanding of any issues with your oral health. Our doctors believe that patient education is essential for successful treatment. The doctor will explain the results of the exam, show you your intraoral photos and inform you about any issues that were identified. The doctor will review with you all of the options available, taking care to explain each one thoroughly, and then together with you will draw up a treatment plan that best suits your needs and budget. We help you keep your teeth and gums healthy for life! Gum disease is the number-one cause of tooth loss in this country. Regular teeth cleanings and proper dental hygiene habits are critical in helping you keep your gums and teeth healthy. We have exceptional hygienists who listen to your needs and highly trained in dental hygiene. They will meticulously and gently clean your teeth and give you helpful home oral care tips. An ultrasonic scaler uses sound waves to break up bacterial deposits and remove plaque and tartar from the teeth. This device is used in regular teeth cleanings and in deep cleanings. It is a more comfortable alternative to traditional hand scalers. We use advanced dental lasers to disinfect gum pockets before cleaning begins. A soft tissue laser is used to disinfect the gum pockets before the teeth cleaning begins. An antimicrobial oral rinse will be used to further eliminate any bacteria from the gums. When scheduling appointments, we make sure that the hygienist has enough time to clean your teeth thoroughly and also educate you, with the aid of teeth models and videos, on home oral care procedures, so that you are able to maintain optimum health of your teeth and gums between visits. We are offering the above Exam, X-rays and Cleaning for $99 (compared to a regular price of $547). Give us a call and we’ll be happy to schedule an appointment for you.